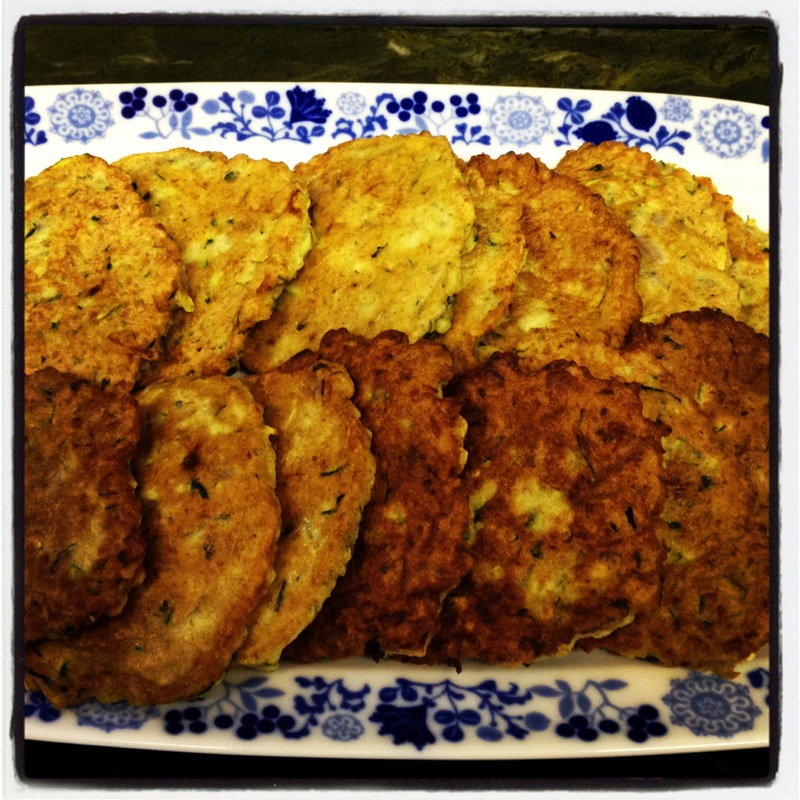 These fritters are very similar to potato pancakes or latkas. With the amazing bounty of summer squash we have had in the Heartshaven community garden, I have been enjoying making these squash fritters a lot this summer. 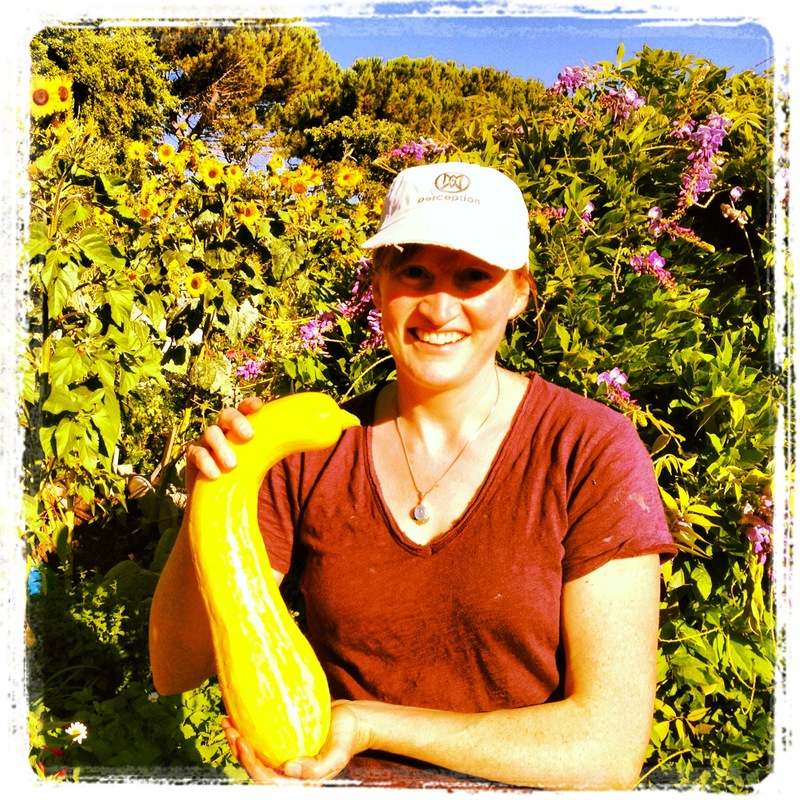 You can use any type of summer squash, from regular old zucchinis to any of the fancy varieties such as Zephyr, Odessa, Rondo de Nice, Striped zucchini, Benning’s green tint, Trombozino, and Lemon squash… I think my favorite are the Trombozino squash. A friend of mine forwarded the recipe from Smitten Kitchen, which I adapt and play with each time depending on what kind of summer squash I have on hand and by adding different fresh herbs or spices to the batter. In a large collander, toss zucchini with 1 teaspoon coarse salt and set aside for 10 minutes over a bowl to let liquid drip out. Press excess liquid out at the end. Return deflated mass of zucchini shreds to bowl. Taste and if you think it could benefit from more salt and add if needed. Stir in scallions, eggs and some freshly ground black pepper. Add flour and baking powder and stir into the zucchini batter. In a large heavy skillet heat 2 tablespoons of oil over medium heat. Place spoonfuls of the zucchini mixture onto the skillet so they aren’t too crowded and lightly press them flatter with the back of your spatula. Cook the fritters over medium heat until the edges underneath are golden, about 3 to 4 minutes. If you find this happening too quickly, reduce the heat to medium. Flip the fritters and fry them on the other side until browned underneath again, about 2 to 3 minutes more. Drain briefly on paper towels then transfer to baking sheet and then into the warm oven until needed. Repeat process, keeping the pan well-oiled, with remaining batter. This entry was posted in Gluten-free, Main Dishes, Recipes, Side dishes and tagged fritters, Gluten free, healthy cooking, healthy eating, summer squash, vegetarian. Bookmark the permalink.